We regret to inform you that the Barbados Defence Force has cancelled the races planned for 6 March 2016. 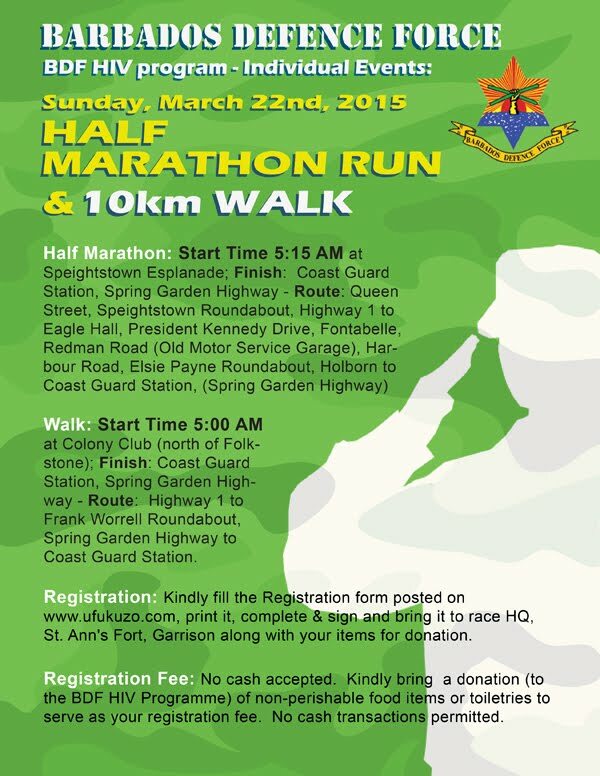 We regret to inform you that the Barbados Defence Force has announced the postponement of the two events - half marathon and 10K scheduled to take place on Sunday 22nd March 2015 due to issues related to obtaining permission from the Ministry of Transport and Works (MTW). As discussed and promised the 2015 BDF half marathon and 10k will take place on Sunday 26th of April. All other details regarding the race remain the same including the bus shuttle service, bus departure times, race route and start times. Contact: Sargeant Venice Forde, BDF, servicedoc@hotmail.com. Tel: 436-6185. A contribution of food items to the BDF HIV food-bank will gain you admission to participate in the event. No race fee. No cash prizes offered. Shuttle buses will be available to transport participants to Speightstown and Colony Club from the Coast Guard base (park close to the flour mill). Buses depart at 4:15am! If you require the use of the shuttle please indicate via email to servicedoc@hotmail.com. Registration opens from March 9th, 2015 at St. Ann's Fort. NOTE: The BDF St. Ann's Fort gate closes to civilians daily at 10:00 PM. Try to complete your registration exercise by 9:00 PM. Registration for both events will close at 9:30 PM on Sat. night 21st March 2015. No registration on race morning. 2014: Once cancelled by the organizers, a group of Ufukuzo runners decided to do a 21.1Km timed training run along the same route.